Puppies are expensive. Often times there are adoption fees, vaccinations, vet bills, food, snacks, bedding, training, and so much more, and those are just the essentials! It’s easy to suffer from a little sticker shock when you start adding up the dollars necessary for raising a puppy (but they are so worth it!). When it comes to entertaining your dog with toys and games, it’s easy for that dollar amount to skyrocket. A quick search on PetCO.com revealed toys as expensive as $41.24 (that’s after a 25% discount! ), and toys on average sit between $10-15. So stockpiling your dogs toy bin can be quite difficult. Skip the big name stores and go to second-hand stores. Store’s like Marshal’s and Ross are great places to pick up the same puppy toys as Pet Co, but at half the cost (not to mention dishes, leashes, etc)! The fun part is a store like Ross does not track their inventory from store to store, so shopping in their stores is like a scavenger hunt for new goods! Fun for your inner shopper, and a huge payoff to your pup (and your wallet!). For a little more adventure, we’ve gone toy shopping in Goodwill and thrift stores all across Seattle. Goodwill has a great pet section, sure, but the pay off is finding a fun stuffed animal from the kid’s toy aisle. Kira came back with a stuffed horse and a mopey Eeyore that drove Pickle nuts! 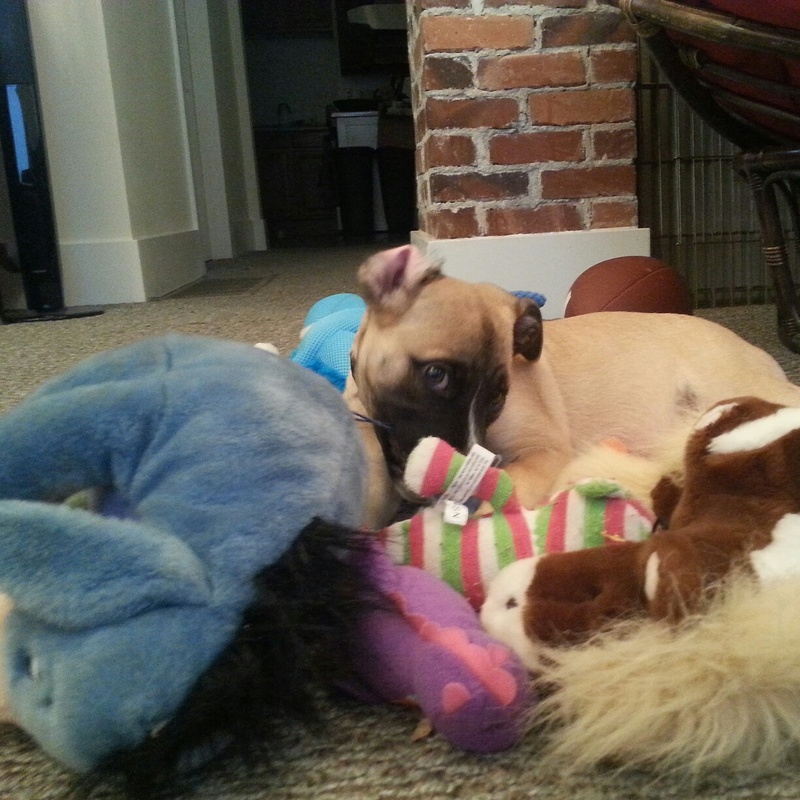 I think the smells from these toys cannot be replicated, so it puts her on sensory overload when we play with them. 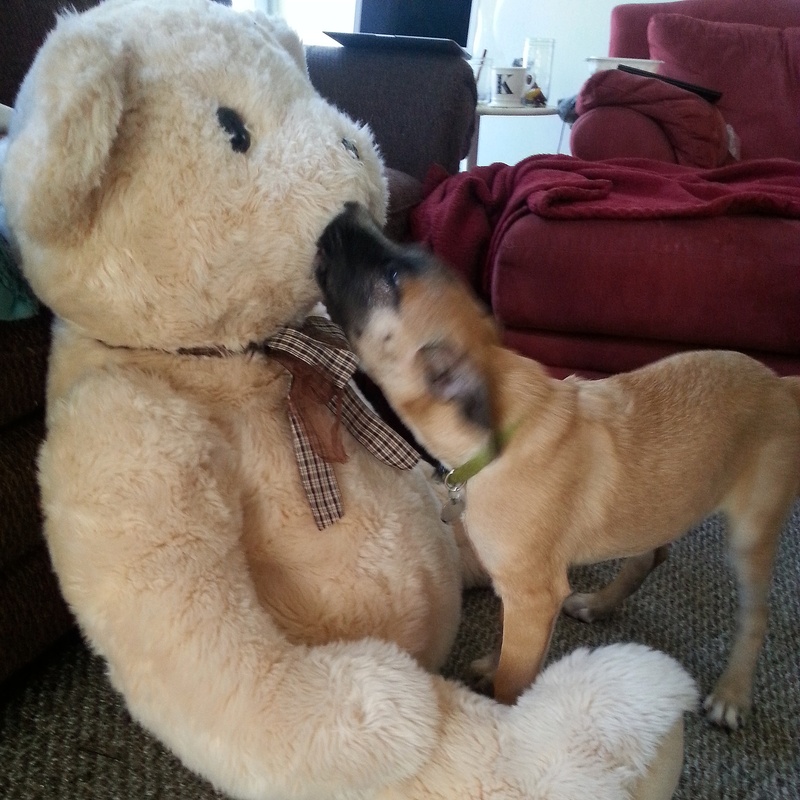 For an added bit of fun, we bought a giant stuffed bear (for $6) that Pickle wrestles with and uses as a dog bed. We ran it through the dryer on high to kill any possible bugs, just in case. Make sure if you are purchasing none dog approved toys from thrift stores that you remove any hard plastic eyes or attachments so your pup doesn’t choke. Also make sure they don’t eat any of the stuffing from inside as it could cause blockage issues. There’s a little extra work needed, but worth it! Believe it or not, your home is already a great resource for dog toys (if your pup chews on everything, maybe it’s not a surprise). The crunching and texture of a plastic soda bottle mimics the same crunchy texture inside loads of existing dog toys. Before Pickle’s jaws were strong enough to cause problems, we would give her glass bottles that she could nose around the floor (she tried and tried to get the sugary drink from inside the bottle). Any old or torn shirts can be balled and knotted up to create toy ropes. It’s recycling for your dog! Pro tip: At the bottom of any treat bag is a pile of crumbs. Don’t through them away! I mixed mine with some water and pumpkin puree, and then froze it in an ice-cube tray. Now, whenever Pickle is bothering me in the kitchen, I can toss her a cube and it’ll keep her busy for a couple minutes. Long enough for me to finish cooking dinner. We’ve covered toys, what about games? A dogs easily exhausted if they are mentally stimulated, and simple scavenging games can exhaust your pup while buying you a couple minutes to breathe. Our game is quite simple, and quite effective. The set up is simple. Lay some of your pups favorite treats on the ground, then cover it with a blanket. Lay some more treats, add some toys, fold over the blanket, and repeat (as many times as you can). Your dog will have to dig through all the blankets and queue into their scavenging instincts, exerting both physical and mental energy. Your dogs are precious members of the family, and as owners we want to give them everything to ensure they have a happy life. Unfortunately the bill can get out of control before we have time to realize. Luckily, there are simple ways to give your dog lots of joy and entertainment, all it takes is a little creativity in your day. So get out there and spoil your pups! 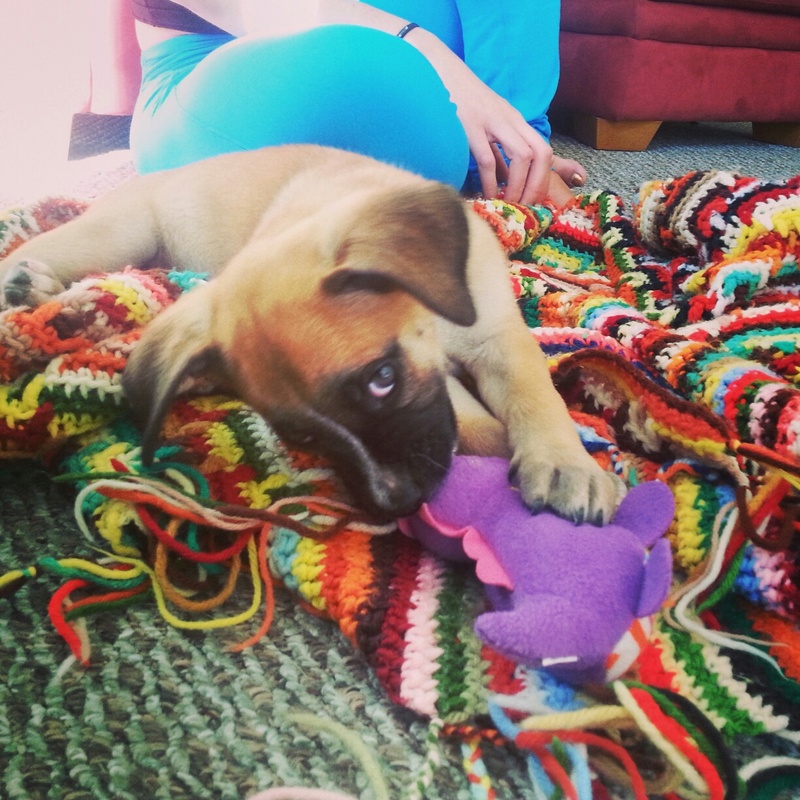 Have any insider tips on puppy entertainment? Share them on Facebook, Twitter and show off on Instagram! Pickle has broadened my horizons when it comes to visiting places in Seattle. From time to time I’d like to highlight some of my favorite dog friendly places. I’m not being compensated for this post, just sharing my opinions on what I consider some pretty cool places in the city. 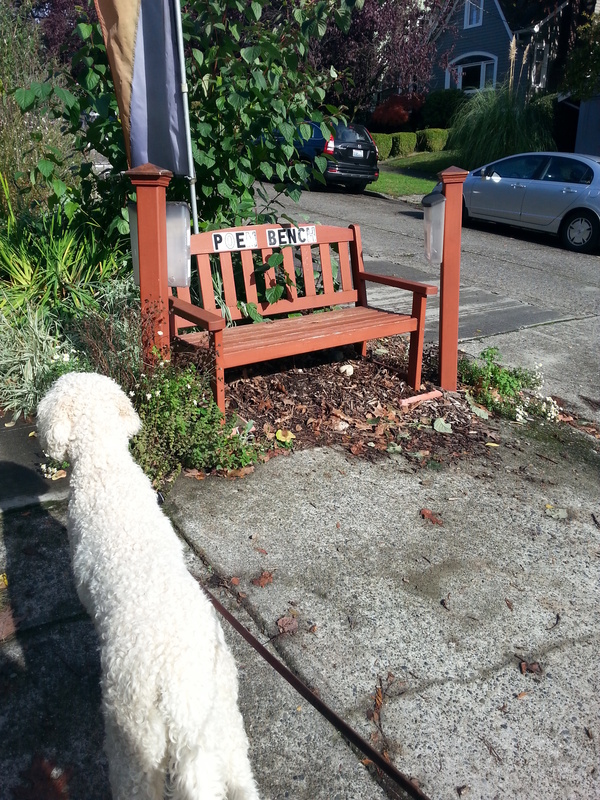 This week’s edition of “Dog Friendly Seattle” brings us to Chuck’s Hop Shop. Chuck’s has two locations, one in Seattle’s Central District and one in Ballard. Since the Central District location is two blocks from our house (so convenient, right!?) I can really only speak for this location, but rest assured that both are great! What: A combination craft beer shop and bar. Chuck’s has hundreds of selections of beer, cider and wine in their many coolers, as well as 50 rotating ciders and beers on tap. A great place to come hang out with your friends, watch a sporting event on their many TVs (they had an old Muhammad Ali fight on last week!) and play a board game. Chuck’s is rather spacious, offering both indoor and outdoor seating, and is both dog and kid friendly. Come down to buy a six pack to go, a pint to stay, or fill up that growler for home. Why: If the hundreds of beer selections weren’t reason enough, how about the rotating food trucks they have in their parking lots each night? Or, how about the fact they are dog friendly (great!) and family friendly? How about the fact they have a freezer with Full Tilt ice cream (so many vegan options)? How about the spacious indoor/outdoor seating? Great location? Cool staff? Okay, if you don’t get it by now, I can’t help you! How: With friends, with your dog, your family, or even just to peak your head in to get out of the cold, Chuck’s has lots to offer to every beer enthusiast. You can order one of there 50 drinks they have on tap, or buy a bottle from the refrigerators to go or drink on site (for a small cork fee). The bar tenders are always super friendly and helpful in helping me pick through all the choices and making a decision. Don’t forget to fill your growlers! Chuck’s is just one of the many dog friendly places to visit in Seattle. What are your favorites? Share them in the comments section, on our Facebook page or on Twitter. Bordetella: What it is, and what do I do? Last week, my girlfriend brought our puppy to her regular puppy play class. She anxiously nosed at the gate, anticipating the fun she was about to have with all of her puppy pals. But then, seemingly out of no where, our puppy Pickle let out a hoarse cough. Immediately, the instructor picked her up and told us we needed to leave. There was no way that a puppy with a cough was going to be allowed to interact with the other pups. Later that night, as my girlfriend recounted the story to me, I immediately thought the worst. Kennel cough is a common (and potentially serious) illness that effects puppies. However, it is also highly contagious and though the initial illness is not fatal, the symptoms that arise from the puppy being ill could pose health issues. My background as a boarding kennel assistant had me nervous that we were facing a real serious problem. Not helping matters was the fact that only 48 hours before I had learned that Pickle was treated for kennel cough when she first arrived from Georgia. That night we were on the phone and setting up vet appointments, and the next afternoon, Pickle was getting her physical exam and I was nervously answering health questions (typical first time doctor visit as a parent). Fast forward 45 minutes, and the vet gave me some reassurance that he didn’t think Pickle had kennel cough. She had some mucus build up in her lungs, but she hadn’t coughed in nearly 12 hours at this point, and that was a good sign. As a precaution he prescribed antibiotics and advised us to isolate Pickle from other dogs (considering we would’ve done that anyway, it was no big shock). Kennel cough is the more general term to describe Bordetella, or canine tracheobronchitis. Kennel cough is a highly contagious respiratory illness that leads to inflammation of the trachea and bronchi. Kennel cough usually affects a high percentage of dogs at least one in their lifetime. Symptoms usually show as heavy, hoarse coughing, dry hacking, and retching. Serious cases could result in a loss of appetite and loss of energy. Puppies, elderly and pregnant dogs are usually at a higher risk due to their compromised immune systems. In severe cases, symptoms progress and can include pneumonia, fever, and even death. Kennel cough was a term coined to describe the illness due to the frequency of transmission is boarding and shelter facilities. Close proximity of dogs and dirty conditions of unkept shelters or kennels can lead to the fast spread of the illness. But Bordetella can live in water and can be transmitted through shared water dishes, or even simply through physical contact between an infected dog and another dog. Due to its high level of contagiousness, infected dogs are isolated until they can recover. Kennel cough is diagnosed by a vet, and is conducted based on the symptoms of your dog. Blood tests and urinalysis are run and conclusions are made by the vet. What do I do if my dog gets Bordetella? Treatment depends on the severity of the symptoms. If your dog is not showing signs of lethargy, fever or loss of appetite, the illness may be allowed to run its course, much like a human cold. However, if the symptoms prove to be severe, antibiotics and anti-inflammatories will be prescribed. Stay in contact with your vet and be aware of symptoms in case they don’t subside. Prevention is also possible. The easiest thing is to avoid places where there are high concentrations of dogs. Honestly, though, that’s like teaching abstinence to high schoolers pumped up on hormones. It’s not realistic. Even if you have never boarded your dog in a kennel, dogs can get kennel cough from shared water sources (think water bowls outside your favorite Starbucks). Interactions with strange dogs on the sidewalk also poses a threat, so avoidance is not realistic. The best course of action is to seek out a vaccination from your vet. Although not 100% guaranteed, vaccinations would protect your dog from all the real world issues they will inevitably face. In the end, kennel cough is a potentially serious, yet easily treatable illness in dogs. Though very common and highly contagious, only dogs experiencing severe symptoms (lethargy, fever, etc) face any real threat. Luckily for Pickle the illness has subsided, and luckily for us, kennel cough isn’t contagious to humans. So, despite being sick, there was no interruption in our snuggle time! Writers note: The opinions expressed in this post are my own, and stem from my own research (EKC and AKC resources) and experience (as a kennel assistant, walker, sitter, owner). I encourage readers to respond in ways they feel appropriate. I love conversations, especially on a topic like this. This evening, the Enumclaw City Council voted to potentially lift a 25 year ban on pit bulls in city limits. The vote came under much scrutiny, and among strong opposition, the city council decided late Monday evening to keep the ban in place. This was an unfortunate blow to the push for cities and municipalities to lift their antiquated bans on pit bulls and other bully breeds. The hatred and opposition that exist towards bully breeds stems from misinformation and a gross misuse of media headlines. In a post on SeattleDogSpot.com, Robert Pregulman recounts how media outlets like KIRO in Seattle grossly misinterpret statistics to mislead public perception and sway public opinion. For example, KIRO cites a study where pit bulls are 8 and a half times more likely to bite then any other dogs. A closer look at the study shows that the study only compared bites between pits and Labrador retrievers. They also only compared fatal bites, not over all biting incidents. I am a believer that bully breeds are the victim of media sensationalism and by dog owners who do not understand the breeds they deem “violent”. Here’s what I know. In the early 1800’s, bull baiting and dog fighting was a huge source of entertainment in England. Breeders wanted to create a dog that was nimble and strong, and through selective breeding eventually created what was to become the Staffordshire Terrier. This new breed combined the strength and tenacity of the old world bulldog (much taller and more nimble then today’s standard) and the agility and eagerness of the old school terrier. The result was a dog with a strong jaw, but was loyal and not aggressive towards people. Staffordshire Terriers were bred to respect and obey their handlers and be friendly towards people. By the time bull baiting and dog fighting became illegal, the new breed had already caught fire with dog owners. Efforts to create a dog more suited for the home and not the ring resulted in the breed’s recognition in the EKC in 1935. In the UK, the dog became known as the “nanny dog,” admired by families for its protective and gentle instincts. By this time, the Staffordshire Terrier had caught popularity in the US, where Americans admired their strength and loyalty. American’s also bred the dog so that it was bigger than its English counterpart, eventually resulting in the American Staffordshire Terrier, or Am Staff. The breed is characterized by a docile demeanor, allowing for the dogs to be handled. These dogs have also endured decades of discrimination and restrictions because of a past filled with irresponsible breeding and handling. A study by the CDC tracking fatal dog bites from 1979-1998 brings up a couple other points. According to the study, 330 fatal bites over the 20 year span (including several from dachshunds, a yorky and a lab). Yet, if we isolate the data from 1994, there were over 1.4 million non fatal bites across the country. If fatal dog bites only represent 0.00001% of dog bites nationwide per year, how can we reasonably use that as a means to levy legislation? Beyond that, the study points to many different factors, including heredity, socialization, mental and physical health, and victim behavior as key factors in whether a dog bite occurred. Here’s the skinny. 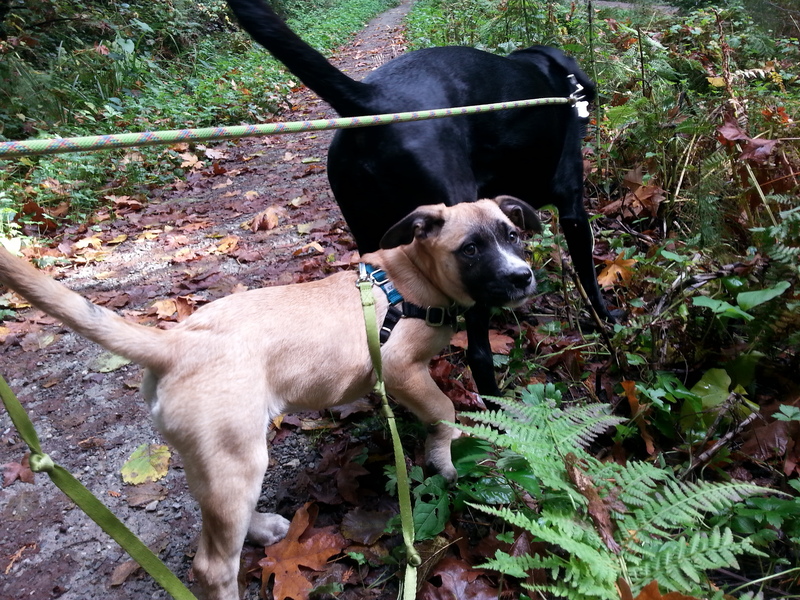 Am Staffs are head strong, devoted, loyal dogs that require a strong hand in training them. They are also docile, kind and protective over the ones responsible to care for them. They have a history of being sweet family dogs, and unfortunately also being over bred and neglected. Personally, I have been bitten three times by dogs in recent memory. Once by a retriever, once by a labradoodle and once by a blood hound. Each time the dog was responding to quick and unfamiliar movements made by my hands. I put the dog in an uncomfortable situation, and the dog responded the only way they knew how. Was I upset, sure. Can I blame the dog, no way. One incident does not determine a dogs personality, and I’m certainly not going to advocate for the banning of labradoodles because I was bit once. My point is that we should not judge a breed because some were dealt a bad hand. Should municipalities work to help owners to be educated about their dogs? Yes. 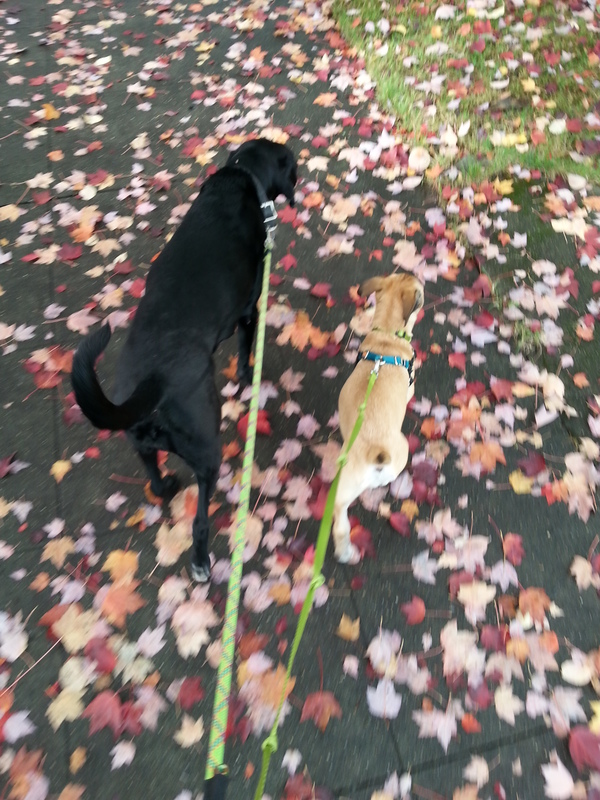 Should they step up leash laws and work to eliminate uncomfortable confrontations with dogs and people? Yes. Should governments pass broad legislation that restricts dog owners from owning particular breeds of dogs? I say no. It’s time for people to become educated and understand that not everything they read is true. Do the research, then come back to me so we can have a real discussion.